Antioxidants are molecules that prevent the oxidation of other molecules. Oxidation is a chemical reaction in which electrons are lost. In living things, this process can be harmful, leading to the breakdown of organic molecules. One challenge of life on Earth is that the same thing that makes oxygen a great electron acceptor, making chemical reactions such as cellular respiration possible, also makes it highly reactive in potentially damaging ways. Oxygen “loves” to take electrons from other molecules. Our cells use that “hunger” to “feed” electrons to the oxygen molecules we breathe in, which drives the process of cellular respiration. However, if oxygen, or unstable oxygen compounds get loose within our cells, they’ll take electrons from molecules that are supposed to have them as easily as they’ll take electrons our cells are trying to get rid of. Some cellular processes also produce dangerous oxygen compounds such as hydrogen peroxide – H2O2 – as side effects of other biological processes. These oxygen compounds are sometimes referred to be scientists as “reactive oxygen species,” or “ROS” for short. Oxygen is not the only oxidizer in the chemical world – any molecule which takes electrons from other molecules is called an “oxidizer.” But the term “oxidizer” does come from the name of the oxygen atom, because oxygen is the most ferocious oxidizer commonly found in the natural world. When molecules within cells lose an electron to an oxidizing compound, it can start a chain reaction; the molecule that lost its electron may now become an oxidizer itself. It now “wants” another one, and may take it from a “weaker” molecule,” oxidizing that one in turn. 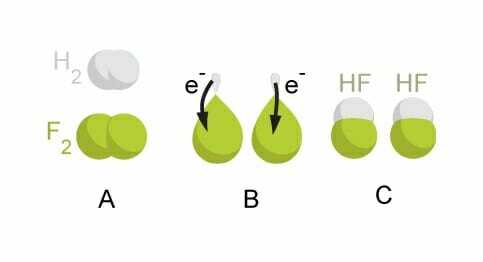 The image below uses the example of fluorine taking electrons from two hydrogen atoms – leaving the hydrogen atoms “hungry” and looking to take electrons from another molecule. Fluorine is an even fiercer oxidizer than oxygen – but fortunately for us, it’s not often found in the natural world! To protect themselves from oxidizing compounds, living cells make antioxidants whose jobs are to work together to prevent oxidative damage to important cellular molecules such as DNA. Some of these work by seeking out and destroying oxidizing compounds, while others block or interrupt oxidation reactions or even repair molecules that have been damaged by oxidation. “Antioxidant” is most commonly used today to refer to some of those compounds – specifically to antioxidants which can be ingested in food, which many health gurus claim will enhance health and delay the aging process. Less commonly, “antioxidant” may refer to compounds used industrially to prevent oxidative damage to food, equipment, and other man-made items. Binding to oxidizers. Some antioxidants bind to oxidizing molecules, preventing them from interacting with other, vulnerable molecules. Some of these can even carry oxidizers such as heavy metal out of the body through the bloodstream and kidneys. Shielding vulnerable molecules. Some antioxidants attach to the most important molecules – such as DNA – and serve as “buffers,” preventing oxidizing molecules from reaching the DNA. Repair. Some antioxidants actually repair oxidative damage: they may carry an “extra” electron or hydrogen atom, which can be donated to molecules that have lost theirs to oxidation reactions. Damage control. Some antioxidants also serve as messengers promoting cell “suicide” through apoptosis. While this might not sound very “protective,” cells that have been severely damaged by oxidation can become cancerous. In this way, these damage controllers protect the whole organism. There is some controversy as to whether eating antioxidants makes people healthier. It has been known for a long time that people who eat diets high in antioxidants are healthier than those who don’t. However, foods that are high in antioxidants – such as berries, nuts, vegetables, whole grains, and fish – are healthy for the body in many ways. These foods are low in sugar and saturated fat, which are major contributors to many common and serious diseases. They are high in fiber, vitamins, minerals, proteins, and unsaturated fats – all of which work to promote health throughout the body, and are deficient in most modern diets. So is it the antioxidants in these foods that’s responsible for the good health of those who eat them? Results so far have shown clearly that taking an antioxidant pill or supplement cannot replace the good health effects of eating a healthy diet that is high in antioxidants. Scientists caution against the dangers of people opting for antibiotic supplements instead of healthy diets. People who take vitamin A, C, and E supplements alone have not been found to be healthier than those who don’t; and 0ne study actually found that taking large doses of vitamin A may actually have been more helpful to cancer cells than to healthy cells. Many scientists agree that more testing is needed to determine the long-term effects of antioxidants alone. But they also agree that eating low-fat, low-sugar diets that are high in fiber, protein, vitamins, and minerals is better for your health than any pill or supplement. Glutathione is one antioxidant that can “donate” an electron and a hydrogen atom to oxidized molecules. This allows it to stop oxidizers in their tracks by “feeding” their need for an electron – and to repair molecules that have been damaged by oxidation, by returning the electron they lost. If you recognize the name “ubiquinone,” good job! This antioxidant is also an important component of the mitochondria’s electron transport chain, which makes cellular respiration possible. Because ubiquinone is very good at accepting and donating electrons, it is believed to fight oxidation – either by donating electrons to oxidizers, thereby neutralizing them, or by donating electrons to other antioxidants to regenerate them. Caretenoids are yellow and orange pigments found in plants, including vegetables such as carrots and sweet potatoes. Scientists have also genetically engineered an orange-hued species of “golden rice,” which helps people in nutrient-poor environments to avoid severe caretenoid deficiencies. Caretenoids are thought to break the “chain reaction” of oxidation by donating electrons to oxidized species. Although the caretenoid is oxidized itself, it is stable in its oxidized form, so it does not go on to damage any other molecules. The “chain reaction” of oxidation then stops there, instead of being passed on to other molecules which might continue to pass the damage along. Like ubiquinone, the caretenoid called Vitamin A serves more than one purpose in the body. In addition to being an antioxidant, Vitamin A plays a vital role in our cone cells, which make night vision possible. Blindness from severe Vitamin A deficiency was a driving motivation behind scientists’ development of golden rice. Vitamin C can act as an antioxidant in two ways. It can interact directly with reactive oxygen species to neutralize them; or it can donate an electron to regenerate Vitamin E, another important antioxidant species. Like so many other antioxidants, Vitamin C serves more than one purpose in the body. In addition to acting as an antioxidant, it is essential for the formation of collagen – the protein that gives your skin, bones, and muscles its elastic strength. Vitamin C deficiency – named “scurvy” in previous centuries, when when people did not know about vitamins, manifests as extreme problems with the connective tissues. In this extreme absence of vitamin C, a sufferer’s teeth may even fall out due to degradation of the collagen that was holding them in! 1. Which of the following is NOT a reason why antioxidants are needed? A. Because oxygen is a dangerous substance that should never enter our cells. B. Because the same thing that makes oxygen essential for cellular respiration can also make it dangerous. C. Because “oxidation” doesn’t just refer to oxygen – many “oxidizing” substances in our cells can damage important molecules. D. Because losing an electron to oxidation can dangerously destabilize important molecules, including DNA. A is correct. The paradox of oxidation is that oxygen is essential to cellular respiration – but it can also damage important molecules such as DNA. It’s also important to keep in mind that any molecule which can take electrons away from other molecules can be an oxidizer. 2. Which of the following is NOT true of the benefits of antioxidants? A. Foods which are high in antioxidants can improve the body’s health in many ways. B. Antioxidant supplements have been proven to be effective at avoiding and fighting illness. C. More study is needed to see if antioxidants alone have beneficial health effects. D. Lack of sugar and saturated fat in high-antioxidant diets are likely responsible for some of their disease-fighting effects. B is correct. There is little to no evidence that antioxidant supplements alone fight or prevent disease. However, it is known that natural foods which are high in antioxidants such as berries, nuts, vegetables, whole grains, and fish, do a great deal to fight cardiovascular and other diseases. 3. Which of the following is NOT likely to be an antioxidant? C is correct. Hydrogen peroxide is not an antioxidant – it’s kind of the opposite! As the name suggests, “hydrogen peroxide” contains oxygen, making it a potential oxidizer itself. Hydrogen peroxide is actually a vicious reactive oxygen species!